Overview - The acclaimed, best-selling novel by John le Carré, about a Cold War spy on one final dangerous mission in East Germany, is transmuted by director Martin Ritt into a film every bit as precise and ruthless as the book. Richard Burton is superb as Alec Leamas, whose relationship with a beautiful librarian, played by Claire Bloom, puts his assignment in jeopardy. The Spy Who Came in from the Cold is a hard-edged and tragic thriller, suffused with the political and social consciousness that defined Ritt's career. "What the hell do you think spies are? Moral philosophers measuring everything they do against the word of God or Karl Marx? They're not. They're just a bunch of seedy, squalid bastards like me." In the game of cinematic espionage, to those really in power, there are only pawns. Sacrificial lambs to be used and abused, to be manipulated and taken advantage of, to be strategically placed and maneuvered, to be lied to and demoralized and dehumanized until they're callously spit back out into the chilly night air. Martin Ritt's tragic and contemplative 1965 thriller, 'The Spy Who Came in from the Cold,' shines a light on one such pawn, elaborating on his greater place within the larger game of political chess he unwittingly plays a part in, a "circus" of deception and clandestine motivations, where the enemy is not communism or capitalism, but cold indifference and exploitation, where his own humanity proves to be both his greatest strength, and his greatest weakness. Based on John le Carre's 1963 novel of the same name, the film follows a world-weary Cold War spy, Alec Leamas (Richard Burton), who is tasked with a special assignment. His objectives are to pose as a communist defector so he can falsely implicate one of the German's high ranking members as a double agent for the British. The goal is for the German communists to execute the alleged traitor, which will somehow serve MI6's larger plans. Unfortunately, complications arise once Leamas infiltrates the group, and the spy's burgeoning relationship with a librarian (Claire Bloom) could spell doom for the entire operation. As the true objectives of his mission finally come into focus, the disillusioned spook will have to decide where his real loyalties lie. Fully emphasizing the "cold" in Cold War, director Martin Ritt immediately establishes a potent air of somber gloom. From its opening shot -- which ominously tracks across the barbed wire laced Berlin Wall -- to its tragic closing images, the film consistently maintains a sense of brooding desolation. Indeed, this specific game of espionage takes place in a bleak, gray world, and Ritt gives visual form to that reality through stark black and white cinematography and noir influenced lighting designs. To this end, shadows play an important role in heightening the characters' internal turmoil, and the director employs a very deliberate aesthetic that frequently uses extended master shots with specific cuts and close-ups for extra dramatic effect. Methodical and contemplative, the rhythm is slow and measured (though, perhaps a bit dragging), and Ritt shows an impressive control of composition and subtle movement. On that note, while the runtime is essentially composed of a series of conversations, clandestine meetings, and closed-door interrogations, the director still makes the dialogue and plot heavy presentation palpably cinematic, enhancing the dry but twisting narrative with visual interest. Mostly eschewing the sensationalized qualities found in other spy thrillers, the story itself takes a comparatively realistic and unglamorous look at espionage. With that said, the subject matter is still dramatized to a certain extent, but the dialogue and situations have a true sense of authenticity and believability to them. The spies here are not superheroes or debonair charmers. They're flawed men, cruel liars, and hollowed out pawns -- abusers and the abused, all manipulated in the service of those who truly control the game. The complicated plot is full of twists and turns, and the cynical subject matter tackles fascinating concepts dealing with exploitation, dehumanization, Cold War politics, the tragic dangers of lingering compassion, and the cold irrelevance of one's specific affiliations. You see, no matter what side of the wall you fall under, here, the game is rigged -- presenting a solemn and defeatist world view that bites with icy perception. Furthering this jaded and pessimistic take on the genre, is the film's downtrodden protagonist. A weathered, burnt-out husk of a man, Richard Burton's Leamas is a tragically brooding figure. Depressed and disenchanted by the heavy emotional and moral tolls of his dubious profession, the character wears the pain of his past in every weathered line on his face. Carrying a volatile reserve of barely contained rage behind an outward veneer of drunken defeat and solemn resignation, one gets the sense that the man is just barely tolerating the inherent grief of his own wretched existence. In the included special features, both John le Carre and the film's cinematographer discuss the contentious professional relationship between Burton and the director -- pointing out how Ritt had to work especially hard to hone in the celebrated thespian's occasionally over-the-top, theatrical tendencies -- and it's this very struggle in Burton's performance that gives the role such power. Through their uneasy collaboration, the director and actor balance a heartbreaking layer of aching sorrow with a more assaulting presence of commanding vitriol, creating a truly engaging dichotomy. His climactic monologue on the unsavory realities of espionage is particularly memorable, and every scornful syllable in his diatribe absolutely stings with self loathing. The film concludes on a haunting note, taking us back to the ominous wall that we began on, perfectly summing up all that the director and author have to say about their subject matter. There, on that portentous border between global ideologies, an all but indifferent shell of a man clings to his last dwindling shred of humanity. And as painful as it is to bear, he can't let it go. In the end, Ritt reveals at least some tiny consolation of hope, as Leamas is forced to choose a side, but his motivations have nothing to do with capitalism or communism or politics or god or country. They're fueled by that little spark that his superiors and enemies always try to dull or take advantage of, but can't quite kill or control. That inkling of tenderness, that propensity toward affection that tries to keep us warm -- even in the cold. 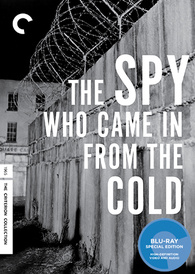 Criterion presents 'The Spy Who Came in from the Cold' in their standard clear keepcase with spine number 452. The BD-50 Region A disc comes packaged with a booklet featuring an essay by critic Michael Sragow. The movie is provided with a black and white 1080p/AVC MPEG-4 transfer in the 1.66:1 aspect ratio. With its noir influenced visuals and striking cinematography, the film comes to Blu-ray with an exceptional transfer free from any unnecessary processing. The print is in good shape, but there are some negligible specks and scratches visible periodically (particularly across the right edge of the frame). A moderate to heavy layer of natural grain is preserved, giving the image a rich sense of filmic texture. Clarity is very impressive, offering a sharp picture with strong dimension. Fine details on clothing and faces are especially prominent, and one can see every line of tormented anguish on Burton's tired and defeated face. The black and white cinematography features a heavy emphasis on shadow and light, and the grayscale is natural and even, offering strong contrast (the way the rain slicked streets pop off the screen is particularly impressive). Whites are bright and though not quite inky, blacks are very solid and, with the exception of some fleeting pulsing, steady. Authentic and richly detailed, 'The Spy Who Came in from the Cold' makes its high-def debut in style. There are some minor signs of damage, but overall, this is a top-tier presentation that should more than please fans. The audio is presented in an English LPCM 2.0 stereo track with optional English subtitles. Clean and full-bodied, this is an excellent mix that serves the film well with no technical issues. Dialogue is clear and rich, completely avoiding the thin quality found in some films of this age. Likewise, the mournful score features strong fidelity and effective stereo separation, perfectly enhancing the somber mood of the film's images. Effects work is modest, but directionality is present across the two channel presentation, creating a solid sense of atmosphere. Dynamic range is wide, conveying gentle sounds like rain and more aggressive noises like a blaring horn with ample presence and no distortion. Bass activity is mostly negligible, but a few scenes feature decent low frequencies (the roaring engine of a plane, for instance). Thankfully, there are no major instances of crackle, pop, or hissing. Crisp and free from any age-related problems, the audio comes through wonderfully with no real complaints to speak of. The 2.0 sound design is fairly restrained, but the mix is respectful and suits the content well. Criterion has put together a fantastic collection of supplements, including a documentary on the author, interviews with the cast & crew, and a selected scene commentary. All of the special features are presented in upscaled 1080i with Digital 1.0 audio, unless noted ottherwise. John le Carre (HD, 39 min) - Presented in 1080p, this is a comprehensive 2008 interview with author John le Carre that covers many facets of the film's production. The novelist describes the circumstances behind the book's adaptation, details meeting the director, and also addresses the difficulties that arose on-set with Richard Burton. He then goes on to praise and critique certain aspects of the film while sharing a wealth of production trivia related to its development and shoot. Filled with some fascinating tidbits, this is a must watch for fans. The Secret Centre: John le Carre (HD 59 min) - Here we get a 2000 documentary about John Le Carre's life and career that includes details about his time as an actual spy. The author's childhood and upbringing are also highlighted along with his books. There are even quite a few clips from 'Tinker, Tailor, Solider, Spy' thrown in as well. Though informative, the presentation is a bit dry and at times a little dull. Martin Ritt (HD, 49 min) - Excerpts from a 1985 audio interview with director Martin Ritt are provided. Ritt discusses his career, experiences in Hollywood, humanist themes, commitment to social issues, feelings about the changing landscape of film, politics, and his approach to working with actors. Candid and packed with insights, this is a strong inclusion. Oswald Morris (HD, 40 min) - A selected-scene commentary with the film's cinematographer is included in upscaled 1080i. The DP elaborates on how certain shots were accomplished, and what it was like to work with Martin Ritt. He also shares more details about the difficult working relationship between Ritt and Burton. Set Designs (HD) - A gallery of twenty set design sketches is included. 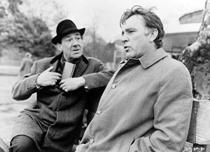 Acting in the 60's: Richard Burton (HD, 34 min) - This is a 1967 interview with Richard Burton. The actor provides an open discussion on his career in theater and Hollywood, and even shares some personal details, like his apprehension about physical contact with others on stage or on screen. The thespian also recites a few selections from plays he's acted in. Trailer (HD, 1 min) - The film's trailer is included in 1080i. 'The Spy Who Came in from the Cold' is a methodical, morally complex spy drama marked by intricate scripting, thoughtful direction, stark visuals, and a powerful performance from the great Richard Burton. The video and audio are both exceptional, offering fans a wonderfully authentic and respectful technical presentation. Criterion has put together a great collection of supplements as well, including fascinating insights from the author of the source material. Though its slow pace won't appeal to all viewers, the film is one of my favorite espionage movies, and this is exactly the kind of top-tier release that it deserves. Very Highly Recommended!